If your computer is running Windows 10 and supports a fingerprint scanner, facial recognition or iris scanning, you might be tempted to log in without typing your password. If biometric support is missing from your device, there are third party solutions which bring this technology to your computer or laptop at a very affordable price. Eikon Mini is a mini fingerprint reader that costs only $25 and is a good example of such technology. As its name suggests, the Eikon Mini is very small compared to other fingerprint readers, measuring 28 x 20 x 15mm (it’s not bigger than the tip of your finger). Its exterior is made of plastic, black, and the surface where you put your finger over is slightly curved, while the rest of the device bulges out. It’s plugged into the PC using a USB 2.0, but if the port is in the back of the computer, it will be harder to scan your fingerprint. Luckily, you can use a USB cable extender with a considerable length and put the reader at the end of it. 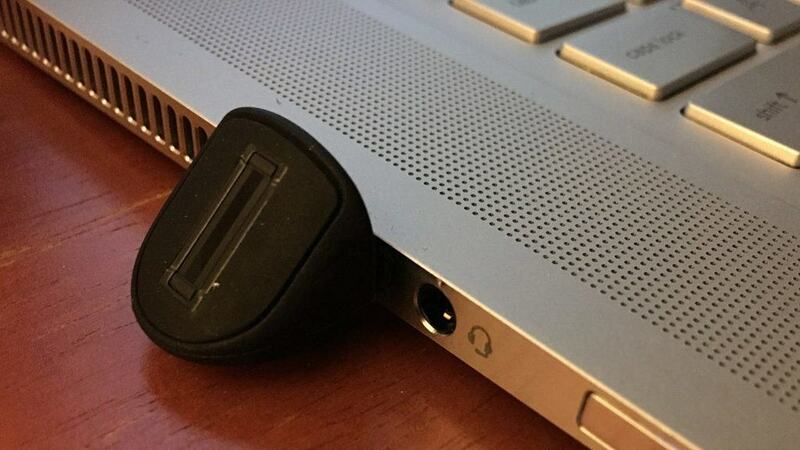 When it’s plugged into a laptop, the Eikon Mini has the reader placed face upwards. So, after plugging in the small device, you will see a dialog saying that Windows 10 is configuring the reader. It’s very simple to set up the reader: just head to Settings > Accounts > Sign-in options and click on Windows Hello. You will register your fingerprint by entering your PIN or password, and the encrypted biometric data is stored locally on your PC. You can register multiple accounts and log in with Windows Hello in Windows 10 so if you have a personal computer, a laptop or a computer at work, you will be able to register Eikon on any of them.